The MR/PM Cyclist would like to take this opportunity to recognize the owners of the "Liquidation World Mall" (living somewhere in Florida - name to come), for their efforts and achievements in urban, environmental improvement. 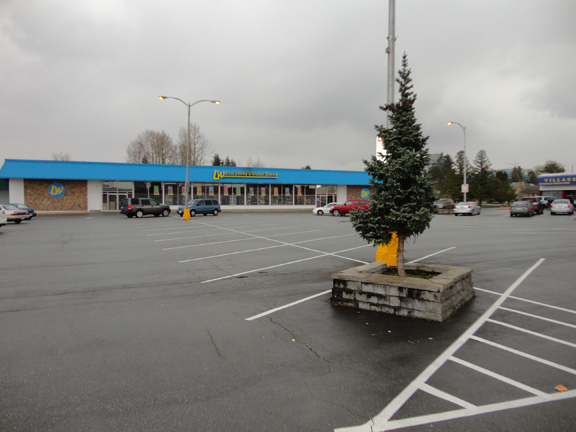 The lone pine tree in the centre of the vast parking lot, has surely set the standard for civic beautification projects. Not only that, but the knowledge and sensitivity it demonstrates to the mitigation of the "urban heat island effect", makes the owners doubly deserving of recognition. Keep up the good work folks, and we'll keep the rent cheques going south and toward the upkeep of your lush, private gardens!